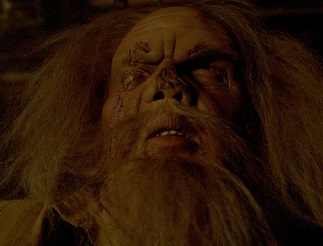 Madman—not your ordinary early 80s Friday the 13th ripoff. Only two years after the release of the original Friday the 13th, Madman was one of many that followed the same summer camp stalker format. But this is one really bizarre backwoods slasher. I instantly loved it because the opening credits give a shout out to the composer of the “electronic music.” There’s nothing better than late 70s and early 80s horror film soundtracks that sound like something off a Gary Numan record. Most of the time, the eerie cold minimal synth soundtrack is the scariest part of the film! That’s not to say there aren’t some eerie visuals in this film. 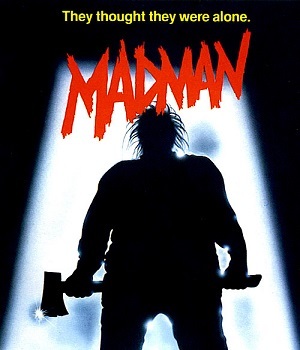 Madman comes complete with a killer who seems to want to be modeled after Jason from Friday the 13th Part 2, but who ends up looking more like Bigfoot from the Six Million Dollar Man (remember, the pet of alien Stefanie Powers?). Some of the murders are gory and brutal, and there’s plenty of killer POV and quick glimpses of him loping through the dark woods around the camp. And, like many of my favorite 80s horror films, this one never tries to give you bright lighting in dark settings. You are forced to imagine what’s waiting in the shadows much of the time. There’s even a commendable, long chase scene, but you’ll be scoffing when the chick decides to hide in a refrigerator…after yanking out all the shelves and getting the food all over the floor. Even KIDS know not to get into a refrigerator—or draw attention to your hiding spot with a floor full of spilt milk. There are some really odd characters and situations in this film. This “summer camp” is about to close…but it’s the week right before Thanksgiving! HUH? There’s a typical campfire urban legend about the killer; if you say his name out loud, you’ll make Candyman really jealous. So naturally, one of the dweebs around the fire calls out the killer’s name. This same dweeb then spends the entire movie sneaking around the woods and repeatedly going into the killer’s dilapidated house and seeing all the fresh carnage piling up—yet never returns to camp to tell everyone! At the same time, one camp counselor after another grabs a flashlight and goes out into the woods to find him and those who went to look for him previously…until we’re finally down to just one counselor! This counselor is played by Gaylen Ross, who starred in Romero’s Dawn of the Dead and played Ted Danson’s drowning girlfriend in Creepshow. She has the worst eye-rolling moments in this film. There’s simply nothing realistic about the decisions she makes, which sadly tarnishes any hopes of her going down in history as a worthy scream queen/heroine. The ending is pretty unforgettable, blatantly borrows from The Texas Chainsaw Massacre, and could be considered a real “twist” ending for its day. Which means you have to remember when this film is coming from to appreciate it. And it’s coming from the 80s, so really, can you go wrong? This entry was posted in Johnny You ARE Queer - Gay Thoughts, Living in the 80s - forever, Movie Times & Television Schedules - Staying Entertained, The Evil of the Thriller - Everything Horror and tagged 1980s, 80s, backwoods horror, Madman, slashers. Bookmark the permalink.